The war in Ukraine has united European countries’ foreign policies, European Parliament President Martin Schulz said on Thursday as he received the International Charlemagne Prize, the press service of the President of Ukraine has reported. "Our response to the crisis in Ukraine - this war is on our doorstep – is that the last few months we have reached an unprecedented degree of cooperation in our foreign policy,” Schulz said. National governments have put their individual interests aside and agreed on a common European approach, he said. “So far, no member state had violated this general approach. It is a success. If everyone pursues their own interests, we are weak. If we are united - we are strong," he said. Schulz also said that Ukrainians had defended European values during the Revolution of Dignity on mass public protests that overthrew former President Viktor Yanukovych. "The Ukrainians kept our European flag in their hands. For people all over the world, Europe [stands for] the protection of human dignity. Europe is the hope for a better future," Schulz said. The ceremony, which was attended by the leaders of many countries of Europe and the European institutions, took place in the historic city hall of Aachen. European leaders in their speeches praised Schulz and talked about the present and the future of a united Europe. French President François Hollande said that together with German Chancellor Angela Merkel they had demonstrated that a Franco-German union was useful not only for Europe but also for a country located in Eastern Europe - Ukraine. Recalling the long hours of peace talks in Minsk, the French President expressed the hope that the resulting agreement would be implemented in order to achieve peace. 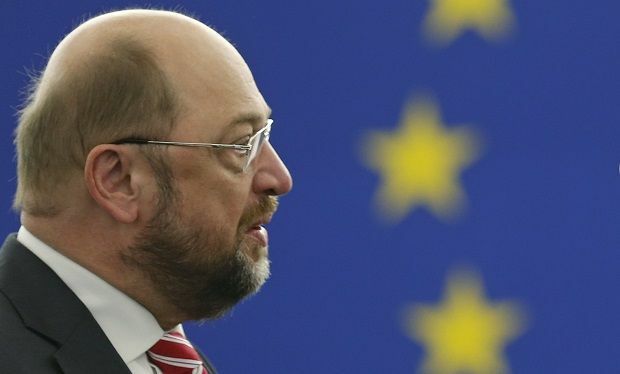 In turn, Ukrainian President Petro Poroshenko stressed the role of Schulz in the development of a united Europe. Poroshenko also noted the great role played by the head of the European Parliament a year ago in achieving the simultaneous ratification of the Association Agreement between the Ukrainian and EU parliaments.